It is a moment of pride for the entire AuroMeera Team for the biggest railway network of the world; Indian Railways has opted for AuroMeera's AuroSMS: ICRS (Instant Complaint Response Server) for better citizen facilities. We also congratulate our channel partner for being the bridge of the technology.. Cheers! 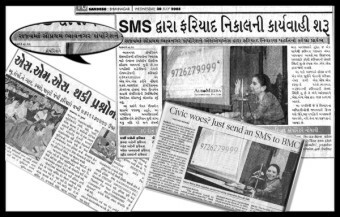 Bhavnagar Municipal Corporation has started using AuroSMS Instant Complaint Response Server for the Complaint Management of the Corporation. AuroSMS ICRS has removed the place and time barrier of the complainer by providing complaint mechanism on their mobile phone. It was never so easy to send a complaint for the better public service. Hurrah! Junagadh Municipal Corporation has started using AuroSMS Instant Complaint Response Server for the Complaint Management of the Corporation. AuroSMS ICRS has removed the place and time barrier of the complainer by providing complaint mechanism on their mobile phone. It was never so easy to send a complaint for the better public service. Hurrah! AuroSMS : ICRS is designed for the public sector units to provide an SMS based complaint response system. Bhavnagar Municipal Corporation has adopted this system for the first time in India. BMC become first Municipal Corporation which accepts complaints through SMS also. AuroMeera's developer has designed the system to facilitate the citizen of the India. PERSON LESS WORKING: As it is an automated system there will not be any personal presence required to operate or manage the complaints. PAPER LESS WORKING: As the complaint will be sent, received and managed through SMS; the complaint management will be paper-less. PERSONAL WATCH: The system will forward the complaint to higher authority if the complaint is pending for specified time. Thereof Commissioner can personally look after the complaint. PERFECT REPORTING: System will provide necessary and additional management information reports on the status of the complaint. Checkout the Current Status of Complaint at any point of time by SMS. Challenge the solve notification if not satisfied with work. Can forward the complaint to the department head if the complaint requires their attention. Can make a remark or note on the complaint. Can ask for the pending complaints if complaints’ records erased or damaged in mobile. Can mark the complaint as duplicate, solved or fake complaint. Can get the status of all, pending and solved complaints at their desk in a second. Can get the detail management information reports. Complaint will be forwarded to higher authority if it is not being solved in specified hours. Based on the data “Congratulation Message” will be sent to Ward Officer if he/she solves some complaints in some time. Based on the data “Commiserate Message” will be sent to Ward Officer if he/she does not solves some complaints in some time. Fuel Saving: No need to come across to Corporation to register complaint. Human Hours Saving: Need not to entertain any phone call or personal meet.